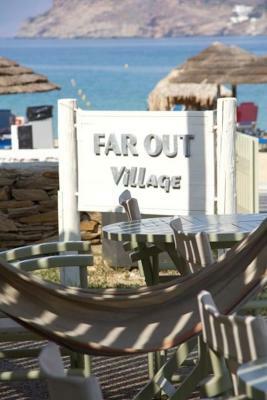 Lock in a great price for Far Out Village – rated 8 by recent guests! Great for partying, very close to the beach (which is beautiful), and there is a lot of easy transportation to other locations like the spa, Chora, and the ferry port. Lots of young people about. Good food close to a great seafood restaurant. Local bus was very regular. A great place for the young and we were their parents, or even grand parents, Fun to watch them the morning after their night hitting the bars! The pool was fantastic and so was the location. Lots of places to eat and minimarts near by. Staff were friendly. The village had everything you needed around it, shops, bars and everything else. The rooms were spacious and quite clean. Helpful staff, big room, comfortable bed. Quiet location away from pool. Great vibe, the place is huge and has all that is needed. Staff try to be helpful despite the limitations of such a small island. Far Out Village This rating is a reflection of how the property compares to the industry standard when it comes to price, facilities and services available. It's based on a self-evaluation by the property. Use this rating to help choose your stay! 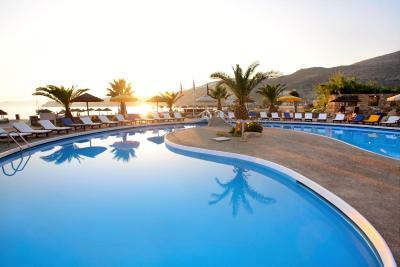 Surrounded by shaded gardens on Mylopotas Beach the Cycladic-style Far-Out Village Resort Hotel offers a swimming pool, bar and restaurant. It features elegant accommodations with balcony. Rooms here will provide you with a TV and air conditioning. Private bathrooms also come with a shower. From breakfast to late dinner, the Far-Out Village restaurant prepares international specialties. You can also simply choose to taste a wide range of homemade pizzas, baked in wood fire oven. Staff at the 24-hour front desk can offer information on Ios Town 2.5 mi away. When would you like to stay at Far Out Village? Opening to a balcony, this room has air conditioning and TV. House Rules Far Out Village takes special requests – add in the next step! Far Out Village accepts these cards and reserves the right to temporarily hold an amount prior to arrival. Large room with verandah. Comfortable and close to all far it has to offer. The staff was not very proactive and sometimes rude. We were waiting for the waitress to come and collect the money for 15 minutes and when we moved to the pool the other one came nearly screming at us without apologizing for the delay. The location was great and the pool area. The bed was really hard and uncomfy and the air con was rubbish. The Wi-Fi connection in our room was terrible and we couldn't use it at all. Cockroaches were having a party in there. We asked for a double bed and got 2 single beds brought together. So uncomfortable. The rooms have nothing to do with the photos! The bathroom was so small I could fit only diagonally!! The noise from the bar next door was unbearable!!! After 22:00, everyone returned from the bar drunk and would scream, move furniture and listen to very loud music!!!! The breakfast had an out of date Müsli, boiled eggs, honey and bread. If you wanted scrambled eggs or sandwich you had to pay extra!!! Not even the sun beds in front of the hotel were free. We had to pay 7€ per day. The promised transfer from and to the port was a lie. They picked us up when our ferry arrived but when we asked for a transportation back to the port they said we missed all 3 buses saying that they have a lot of visitors to have a bus for each one of them leaving . So they can pick up everyone but when it comes to take them back they have more visitors than initially??? Receptionist so rude, when I told her “so now that you got the money you don’t care?” And she said “yes, now you can go to hell”. ! !So overall the worst hotel in IOS by far and maybe the worst hotel I have ever stayed!!! The food was good. Very close to the beach. The only thing was that you had to pay for the sunbeds on the beach that were owned by the property and the aircon didn’t really work. The property was very relaxed, had great facilities such as a fantastic restaurant, sushi bar, pools, bars and very close to the beach. It had a very relaxed vibe which was also pleasing. It’s not far from town either, you just take the local bus up there. Also I loved how they organized transfers from the port for you when you got there for free. The included breakfast was pretty disappointing with very little choice. Internet. I don't know if it's the property or a problem with the island, but it's incredibly slow and useless for anything more than simple messaging. I couldn't even buy tickets or book my next hotel. 3G/4G is almost non existent too.